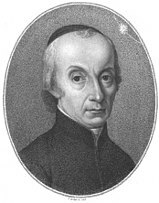 Giuseppe Piazzi (16 Julie 1746 – 22 Julie 1826) wis an Italian Catholic priest o the Theatine order, mathematician, an astronomer. He wis born in Ponte in Valtellina, an died in Naples. He established an observatory at Palermo, nou the Osservatorio Astronomico di Palermo – Giuseppe S. Vaiana. Perhaps his maist famous discovery wis the first dwarf planet, Ceres. This page wis last eeditit on 18 Mairch 2017, at 01:30.